I love the speed and lack of effort involved in making soup. You can pretty much start with the basics of broth, veggies and spices and end up with some amazing creations like my Kitchen Sink Soup. I’ve also made Homemade Ramen before with success. This recipe is one that didn’t even start as a recipe. In fact, I didn’t really even pay much attention when I was making it. I posted a couple pictures of it online to show how easily you can customize soup, and there were so many requests for “the recipe” that I had to dedicate a post to it. 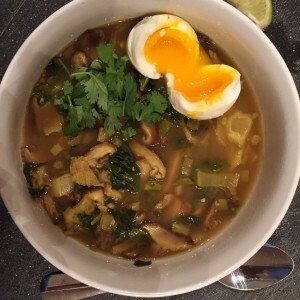 The first night I threw it together and served it ramen-style with a soft boiled egg. The Kid had the same but I put udon noodles in her bowl. 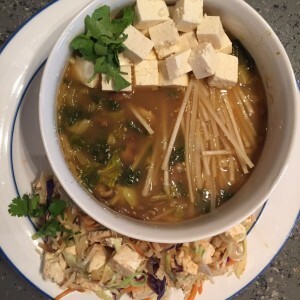 The next day I heated up leftovers and I threw in tofu cubes and rice noodles. The rice noodles are nice since they don’t require boiling like pasta. You can drop them into your soup dry and let them soak in the hot broth for about 5 minutes to cook them. It doesn’t get easier than that. Slice the mushrooms into thin slices. Chop the green onions, separating the white and green parts. Heat a large pot over medium heat and spray with non-stick spray. Add the mushrooms and cook for 4-6 minutes until they are browned and slightly starting to crisp. Add the garlic and the white parts of the onions. Cook for another 1-2 minutes to soften the onions. Add the soy sauce, ponzu, spices and 3 cups of water. Stir to combine. Bring to a boil, reduce heat slightly, and simmer for about 5 minutes. While the soup is simmering, chop the bok choy or cabbage leaves. Stir in the bok choy or cabbage and heat until wilted. Remove from heat. Divide into bowls and serve with slices of lime, sriracha and cilatro for garnish, if desired. Makes 4 servings at approximately 176 calories – 5g protein, 39g carbs, and 0g fat. Drop in different proteins like tofu, boiled eggs, shredded chicken or pork, steak strips. Give different noodles a try like udon, ramen, rice noodles or go noodle-less. The soup is very forgiving and can fit anyone’s taste and calorie budget. It also makes it nice to have options so that even leftovers are a different meal. If you’re interested in working with me to get meals together fast while working towards your health goals, I’d love to chat. Drop me an email, or come on over to Facebook and ask a question. You can also contact me and tell me more about your dream goal.